How to add more light to my long, wide, tall living room? Sconces? Alas, after (1) reading all your thoughts and ideas when I wrote my first story about this new project here at the ranch… and after (2) getting these extremely useful mockups from reader Chase… and after (3) experimenting by digging out some really narrow boudoir lamps from the attic, and plugging them in on the mantle to see how the light would shine…. 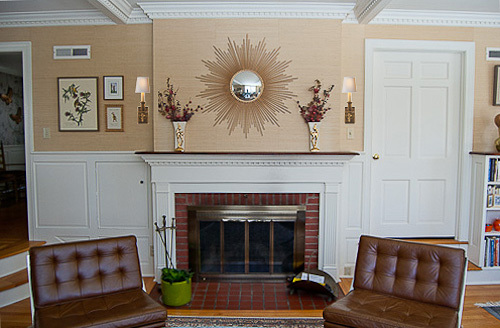 …DH and I have decided that whether you place sconces on the setback wall (first photo), or on the face of the mantel wall itself (above)… sconces will look *not quite right*… kind of crowded… and most importantly, won’t throw enough light anyway. I hope you can follow this. The triangulation of decision-making is torturous, as forewarned. Truly, all the comments that readers provided were really helpful in terms of raising even more options for me to consider — thank you! As mentioned, reader Chase gets mega thanks for offering to use Powerpoint to show how some of my possible sconce options might look. Wow, this was so helpful! 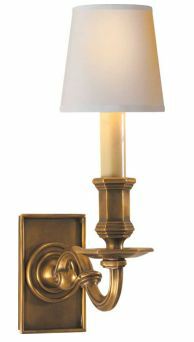 For example, my current “top choice” new (vs. vintage) had been the Visual Comfort Boston Loop Arm Wall Sconce. It had a look I liked — colonial style like the living room… The hand-rubbed antique brass finish was right… The glass matches the modern-milk glass detail on our vintage Stiffel table lamps on the side tables across the room… I liked the glass because I thought it would allow for more light than a shade… It took a Type-A (regular) light bulb, which delivers more light than a candelabra bulb… And the quality hand-feel of the Visual Comfort pieces I saw at my local lighting store was superb. See how many “reasons” there are to choose one light fixture versus the next? It’s exhausting, isn’t it?! I still really like this light. Even so, like I said, we’re setting the sconce idea aside for now. We are setting aside the sconce option for now and instead — based on suggestions from reader comments — we are going to explore pinlight recessed lights in front of the mantel. Over by the big window (shown back in story #1), we’re going to try side tables with table lamps for now. (I’ll come back to this part of the project later.) Continue on for more of Chase’s mockups, along with some of the sconces that I had been considering — it’s still fun to show them. I also really like the idea of these classic Library Sconces from Visual Comfort. Actually, I think these look pretty nice in the mockups — the tall, narrow works. On the setback wall (very first photo in this story), though, they look kinda scrunched in — we need just a few more inches to the right to get the proportions right… moreover, there, they would cast a shadow — I could see this when I placed tall narrow boudoir lamps up there to get the effect of how the light would shine. On the mantel wall, they look okay, but fundamentally, the concern is that they would not throw enough light anyway. A sconce with two candle bulbs to get more light? Good idea *theoretically* but Ack! No, in *reality*! 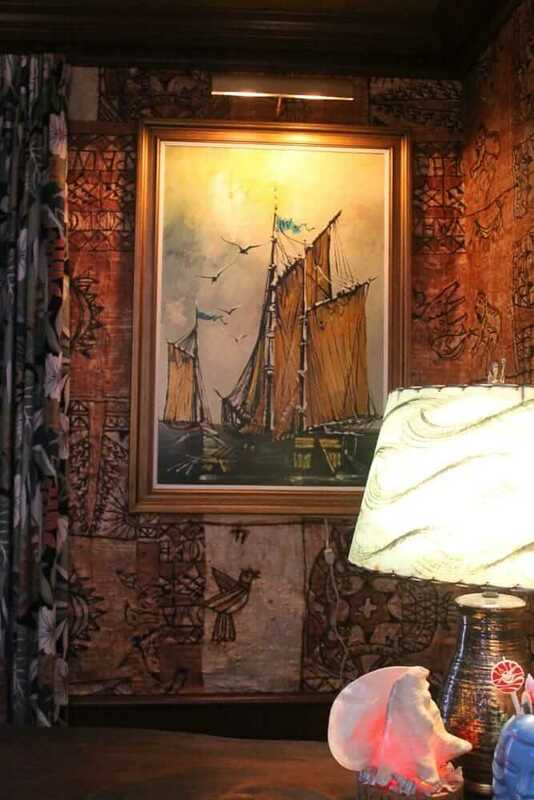 We have these House of Troy sconces in our basement man cave, in the dark bronze finish. We love them there — and there’s that benefit that there are two candle bulbs. But they are way too too here on the mantel wall. Ack! Stay tuned. Research on pinlight can lights is next. Lord help me, I’m pooped on this project already. Pam, I can definitely see why you’d hesitate to crowd your cute sunburst mirror. Overcrowding aside, depending on where you’re trying to get the light to fall, don’t underestimate how much light two sconces can give. 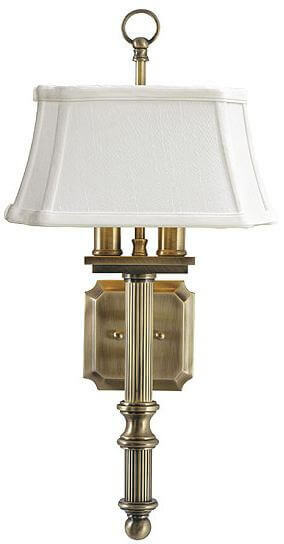 We have these sconces from Rejuvenation in the corner where our piano is: http://www.rejuvenation.com/fixshowW826/templates/selection.phtml, except in a bronze finish with amber shades. It is a corner, so they’re at the two ends of an L rather than on the same wall, but they provide enough light to read or play piano (although I usually turn more lights on). I think one reason is that they direct light up to reflect off the ceiling, as well as sending light in all other directions. The cute Boston Loop scones above would provide less light with the same size bulbs because of their design. But they would still make nice accents and add to the overall glow and ambiance. 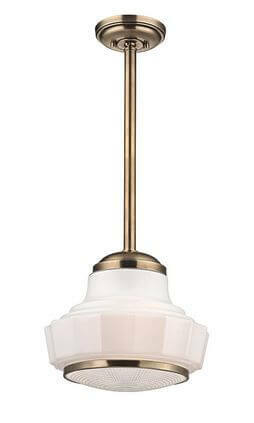 Also, just to clarify, when I hear “pole lamp” I think tension lamp–one that reaches from floor to ceiling. What some people seem to be calling pole lamps here are what I could call floor lamps. Is this a regional thing? A) 6 way 40’s style w/ fabric shade…B) torchiere….C) bridge floor lamp D) goose-neck or goose-arm or swing-arm floor lamp….there’s probably more, I just can’t remember right now! I love my Solatubes. They provide great light when the sun is shining, and you can get them with a light bulb inside as an option. 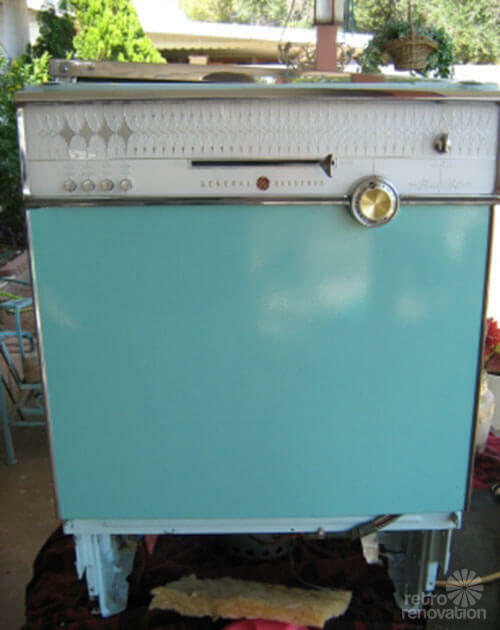 I used them in my mid-century ranch thinking they look very modern. In fact, the light is so good that last week, when the power was off for 12 hours, the full moon light coming through the Solatubes in my hallway was enough to navigate by. The advantage here is that they would not compete with the decor. This is lighting too awesome not to share. 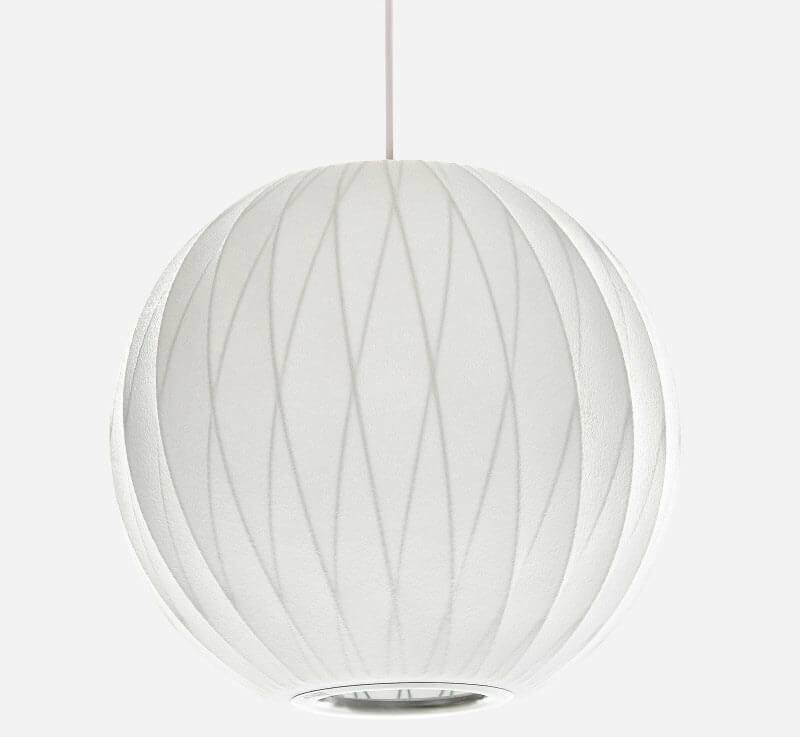 I can’t copy the website with my computer, but look under “Vintage 1960’s Lucite Spaghetti 4 Light Ball Lamp” on ebay.